Welcome to Susan's Garden Party! 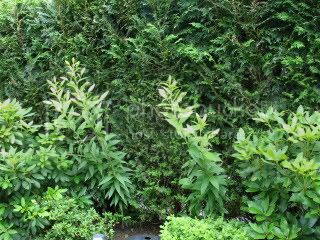 Please check out her blog for some more entries..
You are in for a treat as Susan gives us a tour of her gorgeous gardens.. 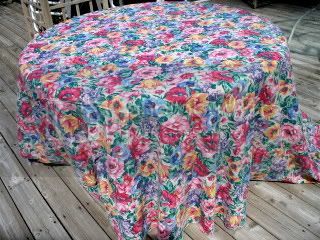 I gave you a little sneak peek in Wednesday's post...I got these pretty floral tablecloths when a party rental place was clearing some inventory. 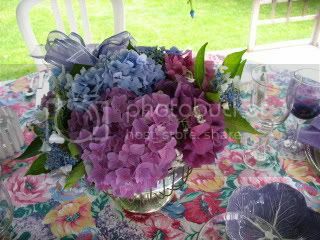 But you can see here how many colors you could use..
Today they held the blue, purple and pink hydrangea...with some baby's breath ..all from my garden.. 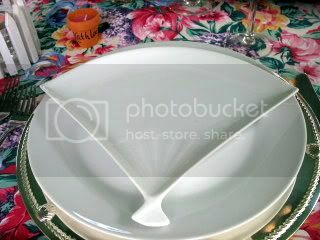 I used white rimmed plates made by gofortun, a white fan shaped salad from Home Goods, silver chargers from Mikassa.. I used purple stems from TJMaxx, and clear goblets that I found at the Pfaltzgraff outlet..I forget the name.. The lavender cabbage leave bowls were a gift from my friend Marigene..they are such a beautiful color! Individual butter dishes from WmSonoma, and the little flower pots are candles from ??? 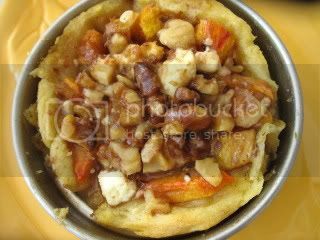 This is a savory peach, feta, walnut tart, drizzled with honey..
For dessert, just a little peaches and cream pie..pie crust, fresh peaches and a sweetened sour cream topping baked...sprinkled with cinnamon.. These lilies are 5 ft tall, and full of buds...I hope they bloom soon.. 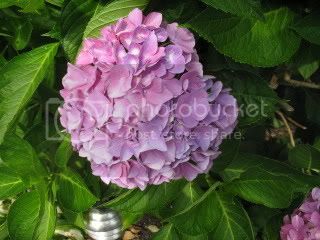 The annuals this year are very late due to the cold and rain..these PINK wave petunias are finally starting to grow..
One last look at my hydrangeas....look at the size of this one bloom.. Thanks so much for coming to the party! Kathleen, GORGEOUS tablescape. I don't know anyone who even comes close to your talents in this area. Each detail is well thought out and perfect. I love the lavender cabbage leaf bowls. I don't think that I've even seen them in that color. The picket fence candle holders are adorable. I love the snail napkin rings. Your hydrangeas are alway beautiful AND huge. AND the food looks tasty, and I bet it is. ... Wonderful party! 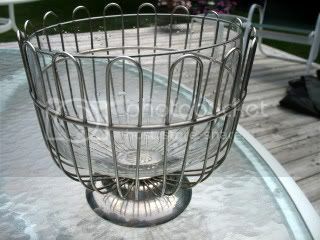 Somehow I knew I would see a wonderful garden table here :) Your silver bowl filled with hydrangeas is stunning. Your grow the most gorgeous hydrangeas there. The adorable snail napkin rings are adorable as are the picket fence candle holders. I have never seen cabbage plates that color either! They're perfect with your table setting. I would love a piece of that tart! Well done, Kathleen, and thanks so much for joining the Garden Party! 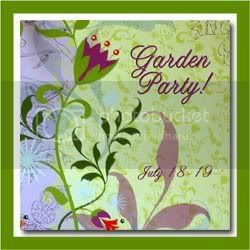 I want to come to your Garden Party! It looks fabulous! Love those snail napkin rings, how unique! I love tablecoths that go to the ground, so romantic! Your garden, flowers and food are terrific as usual! Kathleen, what a beautiful tart. I love your tablescape, and those Snail napkin rings are just tooo cute. The silver bowl filled with hydrangeas is stunning. 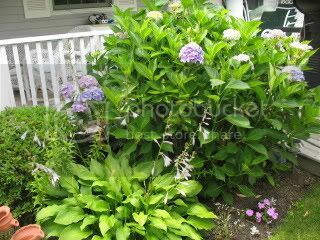 On my daily walk, my neighbor has six lovely hydrangea bushes near the edge of the road, and I always think of you. She has a green thumb just like you. Lavender cabbage plates are stunning! I had no idea there was a garden party and glad I came to peak today at your lovely table and the grape tart is right up my alley but I want the recipe as my husband would enjoy those flavors. To think I just turned down an offer to go to Montauk in 3 weeks I could have stopped over for some amazing dessert. Next time for sure. Wow! You did a great job of getting ready for your party. Everything is so pretty and the food looks delicious! I love your snail napkin rings. Kathleen, make room at one of those tables - I am coming over! 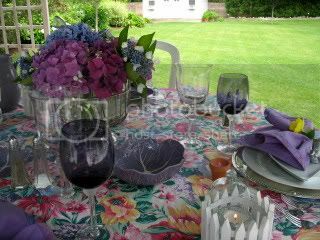 Wow, this one is stunning - to be surrounded by such a beautiful tablescape while sitting outdoors and being surrounded by all your beautiful hydrangeas would be my idea of a perfect party. I think you were holding out on us with that beautiful lavendar cabbage bowl - it is stunning. Before the summer is over can we see how it looks with the purple toile? 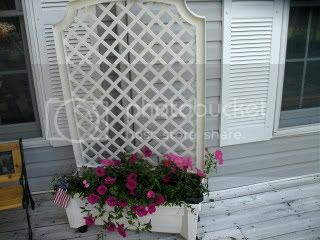 The white pickets and little flower pots sure speak "garden party" to me - I love everything you have shown! 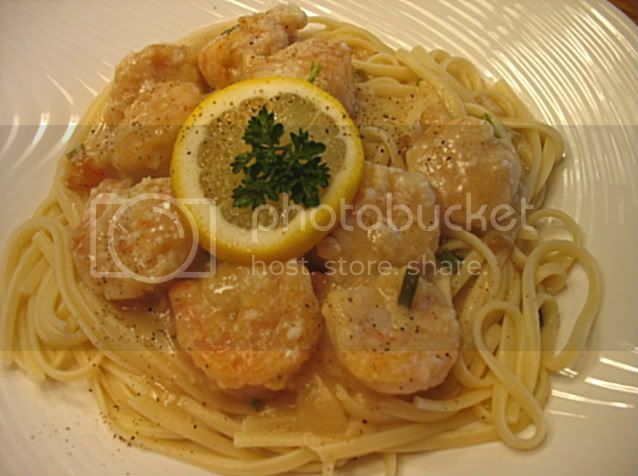 Your food is fabulous looking and perfect party fare. Those cabbage leaf bowls are just the prettiest shade of lavender I think I've ever seen! And oh, I'm so envious of your picket fence votive holders. Everything looks lovely. And obviously you can cook creatively as well! Always well done, Kathleen! I don't even have a smart aleck comment because your tables are breathtaking today! I love the lavender, the cabbages from Marigene are so pretty with all the other things on the table! The tart looks amazing! and we have another gorgeous weekend of weather, good turn of events! 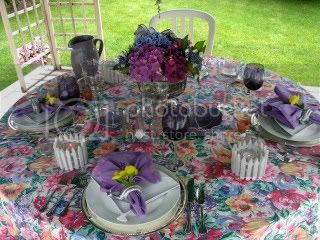 The fresh hydrangeas with the tablecloths really enchance each other. Love those tarts you made. Oh Kathleen...everything looks absolutely beautiful! I love how you played up the lavender. Just perfect with your hydranges. 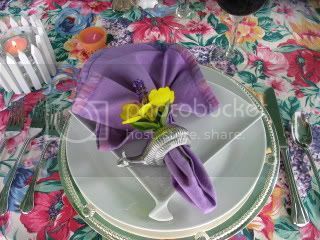 The cabbage bowls are stunning, and what cute napkin rings. They are really different. As for your menu...what can I say, another feast to die for!! Your tablescape is gorgeous, Kathleen. I love the colors, especially the lavendar cabbage bowls. Everything is beautiful and perfect. 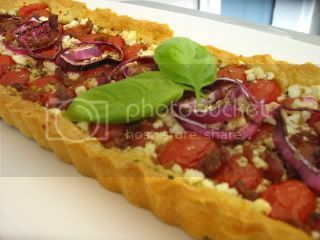 I would love a slice of the tomato, feta tart in the puff pastry shell. Could I stop by for a visit? 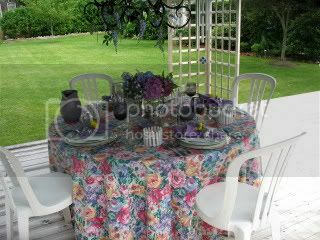 Kathleen - I just adore all the shades of purple and lavendar..perfect color for a garden party! The tart looks so good (another puff pastry) and the Shrimp Francaise really made me sit up and notice!! Man Kathleen, this tablescape is awesome. I don't know where to begin. I love that the tablecloths go to the floor. The napkins are super - how smart to dye them! Love the lavendar cabbage bowls. I have a few pieces of the lavendar cabbage, but can never find anymore. Have you seen it anywhere lately? The snails are adorable, the little picket fences, the bowl with hydrangas, and on and on. Wow! Now the food, that in itself is another stunner. EVERYTHING looks terrific and yummy. 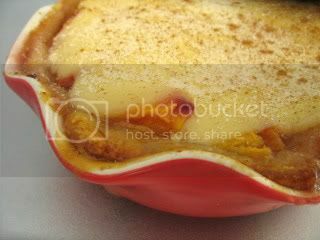 Would you be so kind as to share the recipes? I feel like a get in a rut with my summer cooking ideas and these are simply spectacular. I always love everything that you do Kathleen. This is stupendous. 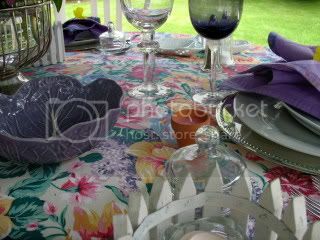 The food looks delicious and the table looks so feminine and lovely for a sweet garden party. Your hydrangeas are amazing. All my best to you. 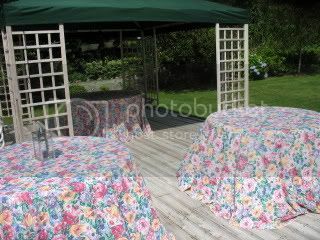 Kathleen, your garden party table is gorgeous! I absolutely love the hydrangeas. Oh, the cabbage bowl in lavender... pretty. Wonderful looking food too. OMGosh...the table is to die for and your menu....delectable! "bj??? O, bj......here I am...come and get me!" Lovely garden...and the food looks wonderfully delicious! Kathleen, everything is just awesome!! Love your tablesetting...just perfect! The food looks delicious!